Underneath Nottingham is an extensive network of 544 caves (at the most recent estimate) that have served a variety of purposes since the earliest inhabitants arrived, such as shelters, places of business, and escape routes. 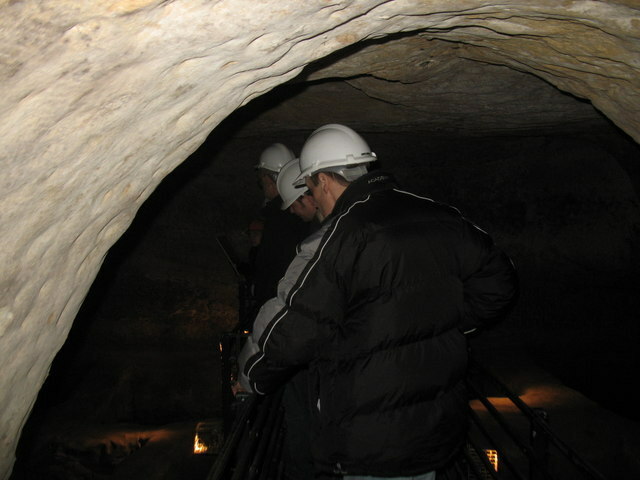 The City of Caves, located under Broadmarsh Shopping Centre, is the only area of the network open for the public to explore. All visitors to the caves must wear safety hard hats, although there is little danger present in these hand-carved caverns. The caves mainly served as homes and shelters and a tour is more about the history of the area than a caving adventure. To capture the long history of the caves and their various occupants, the City of Caves is divided into four vignettes: the Enchanted Well, Medieval Tannery, Slums, and Wartime Alert. After a short walk from the shopping centre into the damp cool environment of the caves, the Enchanted Well is the first site to explore. It represents one of many wells sunk into the caves by early settlers, such as the Anglo-Saxons, to obtain fresh water. The Medieval Tannery dates to the thirteenth century. Actors dressed in period clothes explain the dirty and dangerous process of tanning. The next part of the cave journey contains the original basement walls of one of the worst slums of industrial England. The final stop in the tour is the bomb shelter. Another actor in period dress explains how residents of Nottingham found protection in the caves during World War II air raids. The lights are turned off and an air raid siren is played for the full experience. The City of Caves under Broadmarsh is not the only place in the city to make use of its unique geography. The Hand and Heart pub, located on Derby Road, and Ye Olde Trip to Jerusalem, next to Nottingham Castle, have converted their ancient caverns into dining space. Please see Nottingham and Sherwood Forest for more information on attractions around Nottingham. Great article Erin. When I was a little girl I was and still am today fascinated by hidden places - underground, bookshelves that moved and revealed a hidden escape, caves behind trees etc etc and all the movies I am attracted to have the same theme. Another interesting place to visit next trip to the UK.